Welcome to CNN Spurs! In this section you will find our bylaws and policies, as well as our local arenas, and the contact information for our board members for CNN. Welcome to our new and existing CNN Families! We are so excited that you are going to be joining us for the 2018/2019 hockey season. Please note that hockey registration has closed, however we will still be accepting late registrations for a few of our levels so please contact our registrar at registrar@cnnspurs.com. Want to support young children fulfill their dreams of playing hockey while advertising your local business? CNN Spurs now has wonderful advertising and sponsorship opportunities! Please feel free to browse our Advertising brochure with all the information on how you can sponsor/advertise within our organization. Please take a moment and browse through the list of our generous sponsors and local business advertisements! 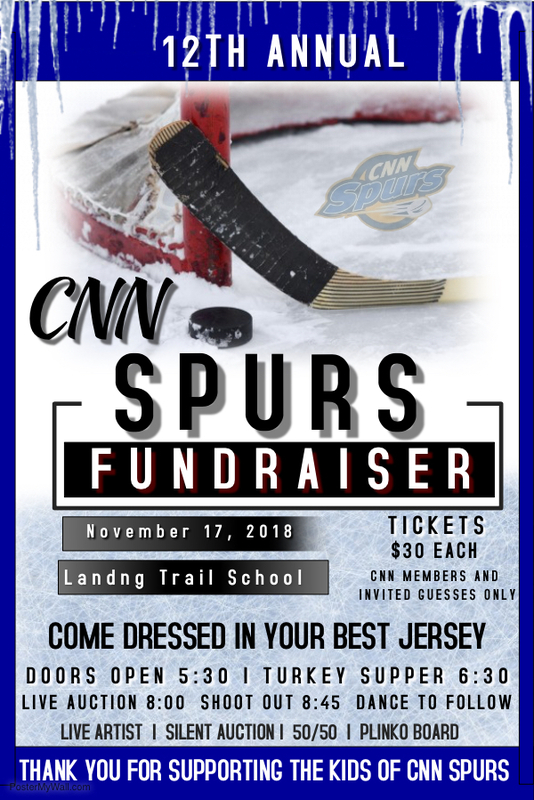 The CNN Spurs would like to thank all of the wonderful organizations who have donated and advertised with our association throughout the 2018/2019 hockey season. Your generous support helps our organization provide the children of CNN with the wonderful opportunity to play hockey! Thank you from the bottom of our hearts! Are you new to CNN? New to Hockey? Are you a seasoned parent just looking for information on the upcoming events, tryouts, registration, etc? Look no further, This section has you covered! Thank you so much to all our wonderful coach and manager volunteers! Our children would not be learning the love of hockey without your hours of dedication and hard work. This section contains all the necessary forms and information to assist you in having a successful season. 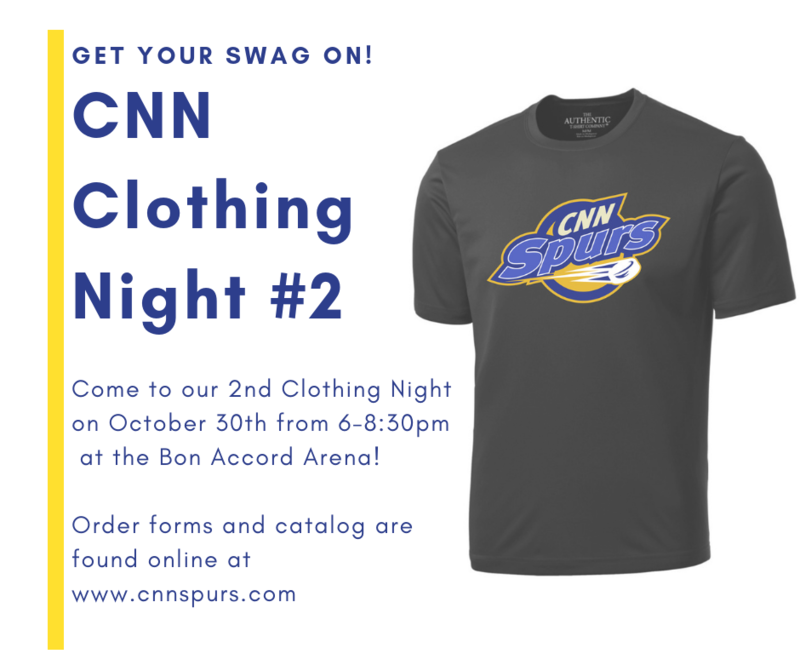 Looking to get your CNN swag on? Come check out our latest products and learn how you can order your very own CNN gear! Once again CNN is proud to be holding our 12th annual Fundraiser Evening on November 17th, 2018. Tickets are only $30 each and can be purchased by contacting our Fundraising Coordinator. We are also accepting donations for our live and silent auction. All inquiries can be made to fundraising@cnnspurs.com. The children of CNN Spurs thank you for all of your support! 1 representative from each family must attend the AGM on April 25th at 7pm at the Cultural Centre or you forfeit your $100 deposit. For more info please check out the link above. Cnn Minor Hockey Association is a substantial organization with teams throughout all divisions from initiation right up to midget. CNN was named after the Crowsnest Road which runs North/South between Gibbons and Bon Accord, thus creating the name Crows Nest North for our association when we combined in the late 1980â€™s to create a stronger athletic program for our local hockey players of all ages!